I am in the market for a new boat in the 42 to 44 size. I like the idea of the deck saloon on the sun Odyssey. Before I make my mind up on which boat to buy, has any of the forum any bad points or problems with the 43 DS. (The other boat I'm looking at is a Moody). Also what in particular should I look at when viewing? I just bought a 2002 SO 43DS. The only negative point I've heard about this model from more than one source is that with all the glass surface area it can get very warm belowdecks in hot and sunny climates, one reason why these DS ships didn't do well in the charter markets. 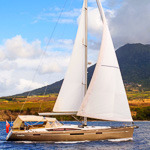 I just sailed 2 weeks in the BVI and must admit that I did keep the curtains closed all the time. Normally the boat comes with 2 water tanks - that might be a bit on low side for a 43 footer (mine has 3 tanks installed). The galley is nicely thoght out and functional, but there isn't much storage space for garbage. Some SO43DS's need their in-mast furling systems "babied" to function effortlessly. 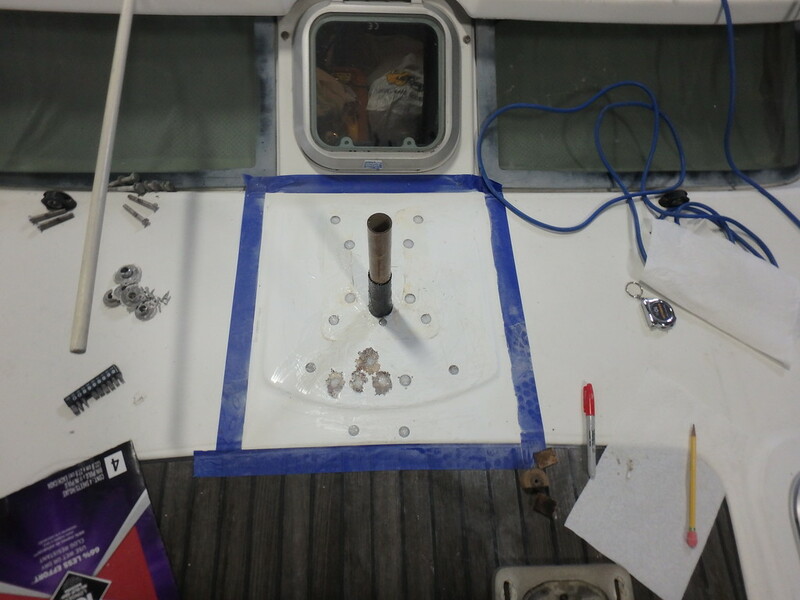 The removable seat on the transom for walk-through is lightly built and sometimes cracking can be seen in that area, as is the fiberglass cover over the companionway sliding lexan cover. The DS style give a lot of room to the cabin and makes the whole sailboat seem larger than it is. Converting the read two cabins to a large one is quick and easy, as is the forward conversion from 1 cabin to a cabin with a side-cabinette-with-two-bunk-beds. The 43DS sails pretty quickly as well and certainly likes stronger winds. I have owned my 2000 43DS for 4 years now and while we love it, there are a few problems. We just had the rig tuned which caused ALL the windows to start leaking. The old seals cracked and water was pouring in. It seems the windows were put in very firmly and one of the windows was broken by the boatyard trying to extract them to reseal. Also, I have been having a seriously difficult time with the rudder. The boat breaks away on a beat and rounds up quite dramatically. If you're not fast enough on releasing the main sheet it will round up to back the jib. Having said that, it's a very fast boat and is extremely easy to cruise. I too, have been having troubles with a fairly fussy main furl system. If you can, get boom furling. If you are in hot climes, you can install exterior white window screen coverings, This works better than interior curtains, but could be used in conjunction. These dramatically reduced our overheating, as a matter of fact, it eliminated it. I should add that since I put the first post in, my rudder has broken off and been replaced. I don't think I can blame Jeanneau as the rudder damage was done before I got the boat. I'm still quite happy with the 43DS and it is a dream to singlehand. I realise that this is an old thread so perhaps by now Baaloo has discovered that his 43ds suffered from the depression of the support for the mast post. All sorts of horrible things happen, the rig goes slack the windows start leaking (or breaking as in his case). There is a solution but it means taking out the mast and rebuilding a more robust step. ($$$...). I think it seemed to have happened to versions of the 43ds up to 2003. The 2004 models i looked at when searching for a 43ds to buy did not seem to have the problem. Think Salty Metals summed up the problems with the mast support pretty well. I looked at a number of these before buying a 2004 version. On those that were affected by the compression, or had been fixed it seems leaking windows was the first give away. Touch wood our 2004 boat has no signs of the dreaded compression. The cost to have it fixed in Europe seems to be around €2,000 - €3,000. No problems with the rudder losing its bite either. In fact when we were hit by a wind bomb (4kts going to 40kts of wind in a near instant) the boat was happy to stay on track, which is more than the crew was! Yes, the windows will let in heat as well as light. We have just one 12,000 btu air con unit on board and this copes on most hot days down here in Greek waters. I appreciate this is an old thread but not doubt someone may find the comments of value. Thank you saltymetals and alenka. I have a 2003 43DS and have owned it since new. I only had one leaking window (just a few drops) and that’s fixed. My concern is if I will have (or already have) mast support problems. Can you please collaborate the problem area, is it below the mast support strut or is the problem at deck level? Can you without big effort see any signs of the problem? 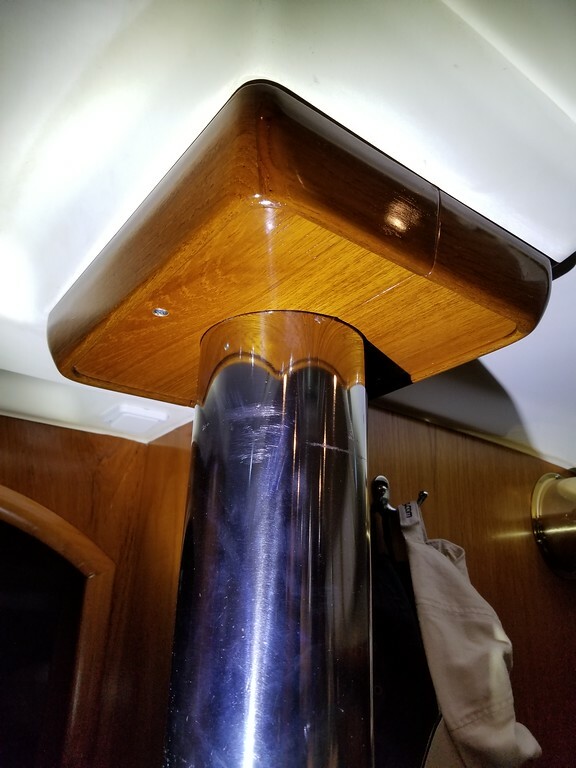 I don't think I have the deck compression problem, but I would think that it makes itself apparent in the same way that the mast step does - the rigging is loose, internal doors start to stick, and maybe you will start to see window leaks. The first photograph in the above link is one I took of a potential purchase. The rigging was slack and the owner had a huge set of bolt cutters on board. Which I assumed were to cut it free should the mast come down. Don’t ask why he wouldn’t pay for the repair before trying to sell, it was all very bizarre. In addition there was a concave area at the foot of the mast on deck. And when the covers were removed inside around the cabin ceiling there were visible cracks in the deck. I think the best way to determine for sure would be to drill a small hole into the wood at the mast step. If this comes out as dry sawdust you are probably fine. If it is wet!!! 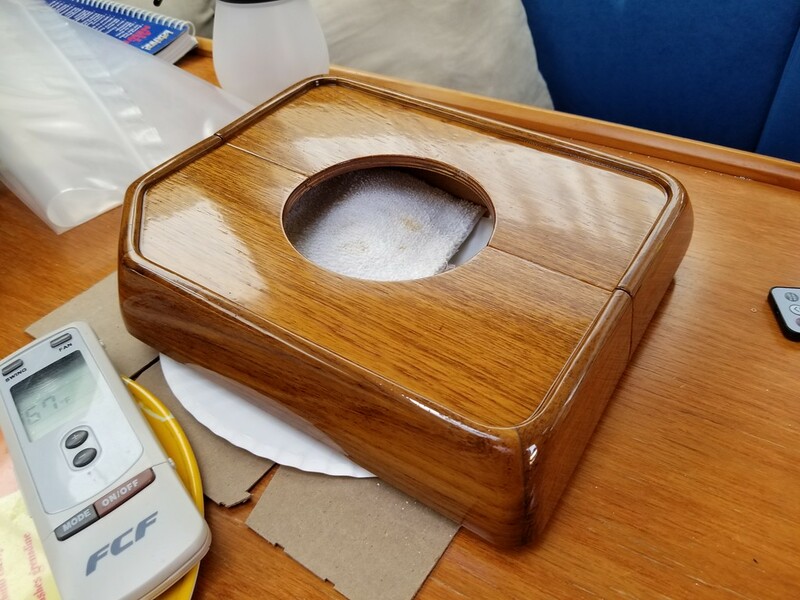 Of course you would need to fill the hole with epoxy afterwards. Has anyone tried this? yes, I started on mine with drilling a few small holes at various locations in the post pad step. The wood was dry in most , damp in some. I was lucky. I ended up overdrilling many holes in the post step , then filled them all with epoxy and rebuilt the base. I also installed an in mast tube to run all the wires and avoid the deck glands (which causes many problems). the new finished product looks like this No more deck penetrations ! the carbon fiber tube I built and installed is totally sealed with various layers of sealants around the wires. I over drilled all the penetrations and epoxied them in for a clean deck, then sprayed gel coat to finish. 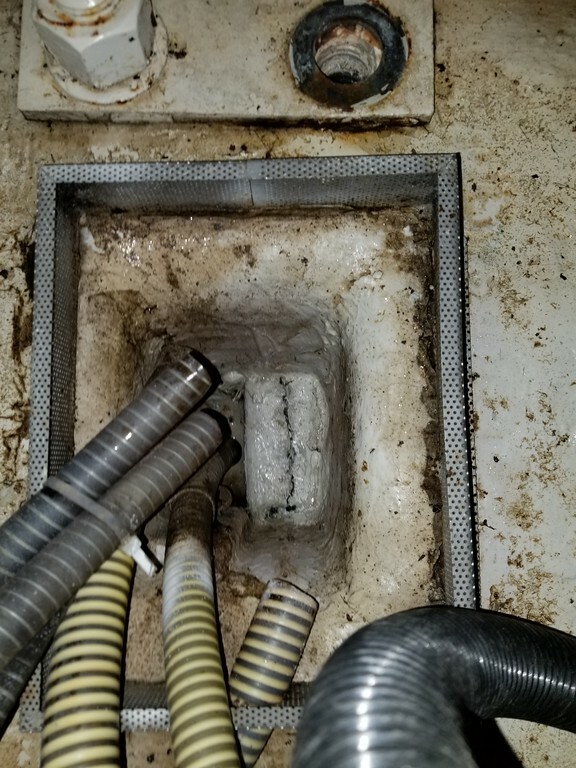 The bolts holding the deck plate are set in epoxy. It has held fine thru a season of rough weather. 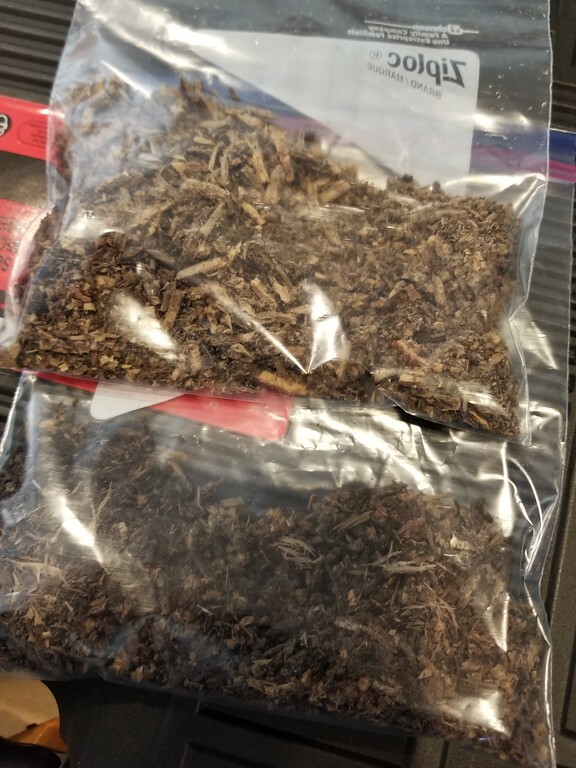 here is some of the material that came out of the post step. On ours, the wood below the compression step was dry at the top and very sodden in the last few inches to the hull. If you do exploratory drills then you need to know you are going down close to the hull. Very useful information. I won't bother drilling into the wood. I have been tempted many times. But if this is the case I think it is probably best left alone and monitor for all the other signs. Concave area under the mast on deck. Cracking at the foot of the compression post where it sits on the wooden block. I was told by 2004 a mod had been made in this area and the problem does not exist. Has anyone with a 2004 onwards boat had this problem?? Having reread the original post I note the author was considering a Moody as an alternative. I know of two moody's that have suffered from the exact same problem. thought I may as well show off the piece I had a woodworker friend make up for the finish inside the cabin. This winter I am getting after my slight weep at one of the keel bolts. I managed to get a few out yesterday. The nuts stayed and the studs backed out pretty easily. will be cleaning up and resealing them. Anyway, I also noted a crack in the bilge box. Will be grinding this area and reglassing too. This may have been a source of weep. ...anybody else seen this? Might fine piece of woodwork. Does your friend take orders?? Sorry, doubtful. LOL. I had to coax him into this one and wait 6 months on this. He is a real craftsman. The stock POS vinyl wrapped original was all rotted out and fugly. I had him make this 1/2" deeper to accomodate wires. Damned good fit and finish. He is indeed a true craftsman. 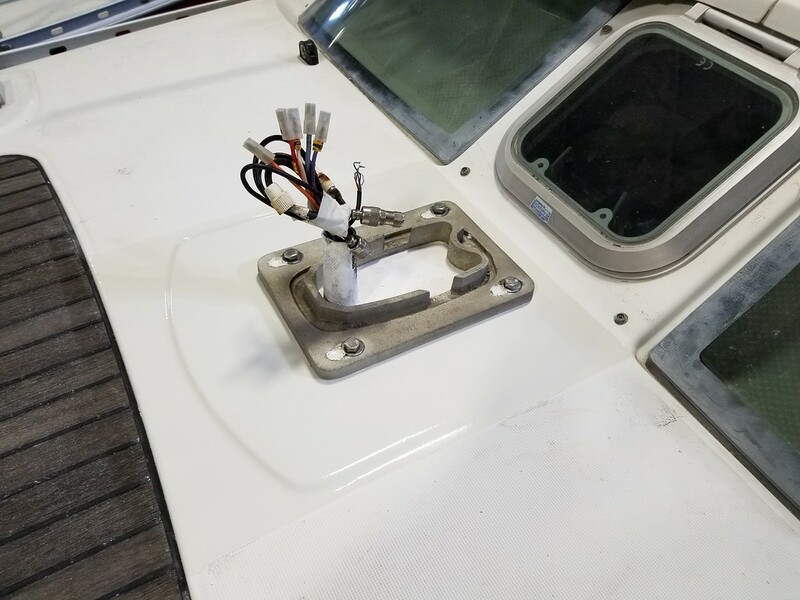 You are very lucky to have hi work on our boat. I was thinking the same thing ! I'd pay for one of those ! Just want to ask a question along the line best if the compression post problem. We have a 2001 43ds. She is in Gibraltar currently and we are planning on sailing her back to the UK in 4 weeks time. She does show signs of a slight compression post problem, leaky windows. My question is, should we sail her back or postpone and get it fixed there? We are based in the UK so dealing with boatyard remotely. Rigging was replaced 2 years ago. Freeflow, thank you for the note! We quite like Gib but it's been nearly a year since we bought her and had the keel and rudder redone completely. We are ready to bring her home now! Thank you, we are also hoping for fair winds and mild seas in our trip! Have anyone on here done the trip from South to North during April? Is mast support problem common for all SO 43DS models before 2004? I am asking since I do own model y. 2002 for eleven years now. Do you have hairline crack around the windows next to the mast? in mine there wasn't much depression but as in your picture there was a gap between the support and the floor boards. I am not an expert but your boat looks fine to me. There is no mistaking the ones with the problem - at least all the ones I saw. 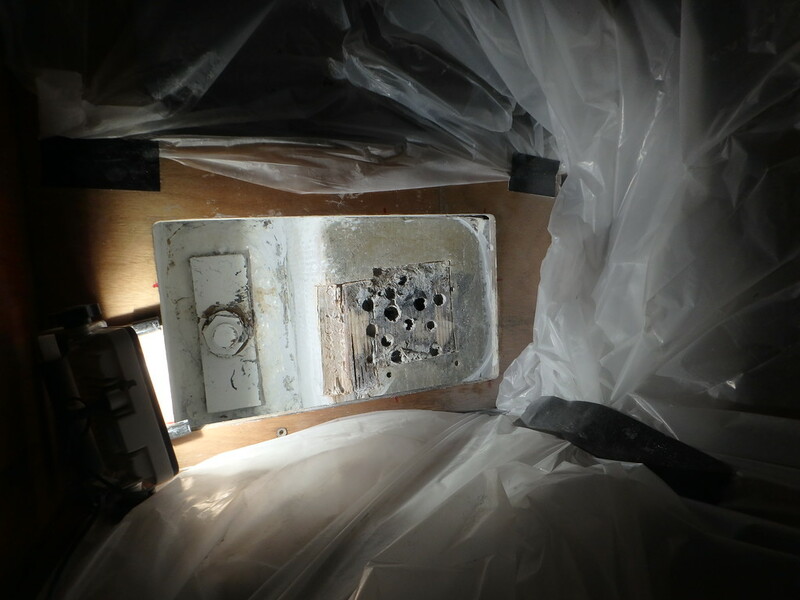 Check the underside of the deck for cracks by removing the panels in the salon ceiling around the mast support. Maybe a simple rig tension metre to check that your standing rigging remains at the same tension over time would be an idea?